You do WHAT with your alpacas? Our alpacas are all ARI (Alpaca Registry) registered and come from outstanding bloodlines that create healthy, calm and well conformed alpacas with superior fleece characteristics. 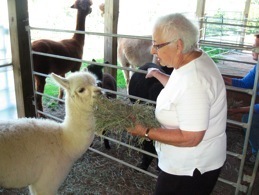 Check out our Herd Members page for more photos and information about each of our alpacas. We select for females that exhibit excellence in breeding, mothering and nursing; and males that consistently produce quality offspring. We maintain a small herd to ensure that each animal receives optimal care. 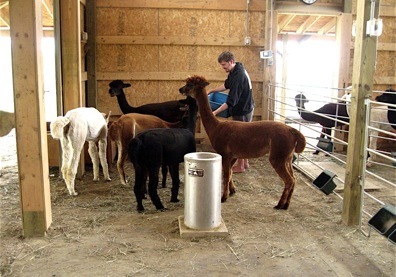 Our hands-on approach produces alpacas that are easily handled for the minimal care they require such as haltering, leading, showing, toenail clipping, and shearing. 1.Good manners for alpacas include their quiet and patient approach to grain and hay handouts. 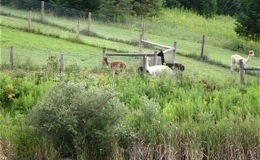 Here, our son, Adam, offers orchard grass which is a daily, morning treat that all of our alpacas enjoy. 2.Sometimes they take a walk all by themselves (within the confines of the perimeter fence, of course). 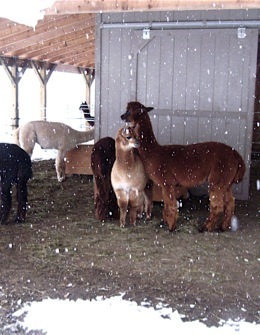 3.Even on the worst days that winter can give us, the alpacas remain active, but also are content to hang out in the barn or, as shown here, to stay dry and protected by the extensive overhangs that are along three sides of our barn. 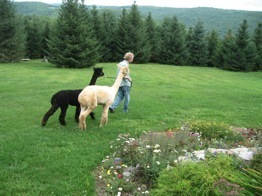 4.Taking our alpacas for walks around the farm helps them to strengthen their muscles, and keeps us in shape, too! 5.Aurora Vickery is feeding a treat to our Aasta, a cria born on Flay Day, June 15, 2009.